We are Godville’s 1st military organisation, ready to fight against the invasion of increasing monsters. Being military we are a cohesion of good and evil alignment's so anybody is welcome to join us. This is a relaxed environment but we do have a ranking system should there be any problems. The Ranking system can be found further down the page here, along with whom you should contact should you need support. Guild Rank does not make you directly an officer or get you promotion. All administration is done via the Guild Council unless the officers decide to vote differently. Specialist award: ※ Awarded to only 1 member based on officer voting. The holder holds this for 2 weeks/1 month. 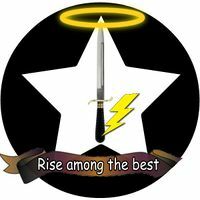 You may add the abbreviated version to your motto, along with our guild's symbol, if you wish. These are level 1 promotions. The higher you get, the closer you are to joining the officers in deciding on how and what we do in the guild. Senior NCO's will require a little knowledge of the game to reach these ranks, and contact Sniper404 if you wish to earn these ranks. These are the members who are under the Guild Council Officer's that run the guild, their input in promotions of those below them is very important to the Officer Staff. To gain a rank of this level or higher you will need to send a private message to Sniper404 and let him know you wish to be considered. There will then be a review of your activity in the guild. This is a simple game. All you have to do is watch your diary entries for the monster/monsters that are posted on our forum. When you fight and win against one of them, make your way to our forum and post it! Add a comment if you wish. You do not have to be a member of the Guild to take part. Post each kill on our forum thread. Private Messages and Guild Council messages will not be accepted. Please, no fighting over what the Guild Officers decide. Their decision is final. If you do not like the game, please keep it to yourself. We are a friendly guild. Should there be any major problems, please contact Sniper404 directly. 2013 July 16-Aug 18 Dragon Hunt with 11 confirmed kills Jimbob64  Dragon Slayer! The guild Officers were hanging out at Skeatseria Lodge one night, ribbing Sniper404 about his _stellar_ placement in their pantheons, and we got to thinking: Sure, there’s a Pantheon of Savings that celebrates the total amount saved, but there isn’t one that celebrates the individual amounts saved to get there. Whether it was an honestly brilliant idea or just a drunken stroke of genius, we don’t care! We’re doing it! Post these diary entry in our forum. There will only be ten spots in each Pantheon. Once all 10 spots are filled, post only donations higher than the donation in the 10th spot. If there are many with the same amount, only the first forum poster will be added unless there are players with lower amounts listed. The stats will be updated here daily. Thank you all in advance for participating! Here we celebrate the temple owners who have socked away the most towards their retirement at any one time. 1 Jimbob64  12:26 AM I'm as drunk as I can possibly be, Soul Supreme. I shall invest these 59741 coins for the future instead of spending them on beer, so that I can be this drunk all the time when I retire. 2 SBFH  Beerburgh GTT 09:36 Got thrown out of a bar for bad behavior. I guess they’re not going to get my money then. I’d better save 42523 coins for my retirement instead. 3 Jimbob64  07:21 Deposited 40570 coins in my ultimate drinking… I mean my retirement fund. 4 Hairplug4men  21:02: The bartender saw my face outside the window and quickly switched the sign on the pub door to “Closed”. I guess I’ll just put 28577 gold coins in my savings, instead. 5 Queen Ant  Deposited 23015 coins in my ultimate drinking… I mean my retirement fund. 6 The ANT  Progress Bar” was closed today. It must have been a sign from above! I’d better add 22247 coins to my savings. 7 The ANT  I went to buy a beer at the local tavern, but the bartender gave it to me on the house for my continued loyalty. I think I’m going to put these extra 20345 coins in my savings as soon as I get off this roof. 8 Dogess  01:57: “Molotov’s Cocktail Bar” was closed today. It must have been a sign from above! I’d better add 20102 coins to my savings. 9 Sniper404  09:04: Ok, Exalted One, that’s enough drinking for today. I’d better put aside 19477 gold coins for the future and spend the rest on praying. 10 Artsonian  07:52: I forgot to pay a bill in “Molotov’s Cocktail Bar”. Guess I’ll rather put 18667 gold coins aside for a rainy day. Here we celebrate the temple owners who have set aside the least for their retirement at any one time. 1 Jimbob64  11:56: No more frivolous spending! I’d better stash 3 coins for the future. 2 Sniper404  11:59: No more frivolous spending! I’d better stash 5 coins for the future. 3 Queen Ant  I forgot to pay a bill in “Molotov’s Cocktail Bar”. Guess I’d better put 17 coins aside for a rainy day. 4 TheGourdGod  08:35: Since when has there been such a thing as “Alcohol Free Day”? All the pubs were closed and I really needed to put my heavy collection of 23 coins somewhere. This pensions and savings establishment will have to do. Here we celebrate the non-temple owners who have sacrificed the most to their God/Goddess in prayer at any one time. 1 Dragolord  16:20: Dozed off while praying. Burning with shame, I donated 5307 gold coins. 2 Joceej13  03:30: Spent many long hours praying. Endowed the temple with 5224 gold coins. 3 The Only Good God  06:52 PM Donated 4588 gold coins to you, Soul Supreme, as a life insurance premium. 4 Goddess Phraea  19:55: Great One, what do you do with the gold I sacrifice to you? Do you use it for hanging out? Anyway, here are 2548 gold coins – have some fun. 5 The Only Good God  01:24 AM I beg thee, Soul Supreme! Heal my hangover and punish those cats that were yowling last night. Here is something for you —1456 gold coins. 6 Goddess Shelleron  16:49: Uh-oh. Fell asleep during my prayers. Wiped the drool from my face and hastily donated 1211 gold coins in the hopes that the Almighty was busy plaguing some distant land. 7 Firegod369  18:06: Mighty One, I am brave and strong, but not very smart. Save me from my own stupidity! Please accept 1109 gold coins as my offering. 8 The Only Good God  10:38 PM Why don't you have your own holy book, Great One? All the other gods have one. please accept 1034 gold coins and hire a holy ghost-writer. 9 Godofbeer  05:58 Uh-oh. Fell asleep during my prayers. Wiped the drool from my face and hastily donated 586 coins in the hopes that the Almighty was busy plaguing some distant land. Here we celebrate those whose heroes and heroines have sacrificed the smallest amount in prayer at any one time. 1 Dragolord  06:39: Greedy priests took away 2 coins. The pile of gold quickly disappeared into the pockets of their robes. I hope they’ll sacrifice it to the Great One. 2 Queen Ant  Spent many long hours praying. Endowed the temple with 2 coins. 3 Sniper404  20:37: Dozed off while praying. Burning with shame, I donated 2 gold coins. 4 The Only Good God  8:55 PM I beg thee, Omnipotent One! Heal my hangover and punish those cats that were yowling last night. Here is something for you -- 2 coins. 5 Lupinelord  19:33: Almighty, I am brave and strong, but not very smart. Save me from my own stupidity! Please accept 2 coins as my offering. 6 Artsonian  21:43: Exalted One, grant me the serenity to accept the things I cannot change, the courage to change the things I can, and the gold to buy shiny new things. Meanwhile, please accept my humble donation of 3 coins. 7 Royal Highness  04:29 I offer 3 gold coins to thee, my Lady! 8 SBFH  05:34 Spent many long hours praying. Endowed the temple with 3 coins. 9 Wrecking ball  12:58: Donated 3 coins to you, Soul Supreme, as a life insurance premium. 10 Artsonian  08:00 AM Great one, grant me the serenity to accept the things I cannot change, the courage to change the things I can, and the gold to buy shiny new things. Meanwhile, please accept my humble donation of 4 coins. 2012-Oct-16 - Guild founded by Sniper404 庙畜. 2012-Nov-13 - Alliance formed with Skeatseria Lodge. 2012-Nov-21 - Pantheon of Donations added. 2012-Nov-25 - Pantheons expanded: added least saved for retirement (temple owners) and most offered in prayer (non-templed). 2012-Nov-26 - Alliance formed with Knights who say Ni. Issue #691, Day 929 g.e., Breaking News: An epic tapestry titled “A hero of the Godville’s Regiment guild writing a letter to the Godville Administrator is being exhibited at the San Satanos museum. Issue #728, Day 967 g.e., Breaking News: The Godville’s Regiment guild reports that one of their heroes can forecast the weather based on pain in an old injury. She predicts that Godvillewood will have sporadic lightning strikes throughout the day. Issue #730, Day 969 g.e., Famous Heroes of Godville: Optimus High - 61st-level adventurer, member of the Godville’s Regiment guild, with the motto “GV’s✪Regiment✪2lt☆”, stands at the 72nd position in the pantheon of gladiatorship under the vigilant supervision of the god T A U R U S . He thinks that a Chimpanzealot slow roasted in its own juices is one of the finest delicacies that Beerburgh has to offer. Issue #786, Day 1024 g.e., Ads: Looking for heroes able to supply required materials in sufficient quantities. The Club of Young Surgeons, Godville’s Regiment guild's hospital basement, Tradeburg . Issue #855, Day -729383 g.e., "Ideabox news:" Sniper404 finds improving ideas an incredibly painful chore, but, as a masochist, he promises to continue to do it. This page was last edited on 25 August 2018, at 11:22.